I visited Dream Second Hand Wedding Dress a few months ago with the intention of getting ideas for styles but came away from the appointment with my dream dress. The whole experience was wonderful from start to finish. It felt very personal (I was an individual, not a number) and I was very impressed with her honesty (there were a couple of dresses that truly didn't suit me!). Sylvia takes great pride in her work and is clearly passionate and knowledgeable about her industry. I would recommend Dream Second Hand Wedding Dress to all brides-to-be. I spent the morning looking for a wedding dress in the city, I found staff could be very pushy and prices were extremely expensive. I am so glad I ventured out of the city to see Sylvia, she was extremely kind and reassuring and patient. She has a huge range of dresses to try on and I was able to find my dress on my first visit. Sylvia goes above and beyond customer service, it is clear that she loves what she does and that is what makes a difference. I couldn't recommend her highly enough! I saw Sylvia's website online and decided to pay her a visit. It was definitely the right decision! She was so helpful and it was such a nice setting for trying on her beautiful dresses. She had a fantastic range of different styles at incredible prices, and gave really good advice but wasn't at all pushy. I would recommend her to anyone, as she is bound to have something which would suit! I went to see Sylvia in December to have a look at her wedding dresses. She was absolutely lovely and so helpful. It was such a relaxing experience compared to the rushed experiences I had in several boutiques. I looked in 14 dress shops and this was by far the most pleasant experience. I found my dream dress with Sylvia and I couldn't be happier. She was also able to refer me to a great seamstress who worked wonders with the alterations. Such a great experience, very personal. Thank you so much Sylvia! 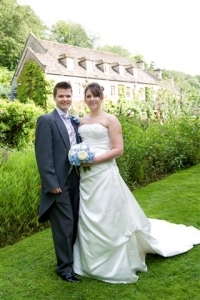 I would not hesitate in recommending Dream Second Hand Wedding Dress Shop. Sylvia who runs the business was more than helpful and very quick to respond to my numerous initial emails about the dress. What was especially great is Sylvia doesn't just run her business 9-5 - she literally responded to my emails at all times of the day and evening (even on a Sunday!). She was very flexible and accomodating in making appointments as we had to travel a long way to get to her, she saw us in the evening. I cannot speak highly enough of her service and I feel so lucky to have come accross my dream second hand wedding dress through her. I would strongly encourage anyone else to visit her website - I was looking for a second hand dress because I couldn't afford brand new but I was lucky enough to come by the exact dress I had fallen in love and it was brand new with the tags for literally half the original price! Thank you Sylvia! I wholeheartedly recommend Dream Second Hand Wedding Dress. I sold my designer wedding dress through this fantastic service but I can't help but wish that I had known about it when I was looking to buy a wedding dress too! Szilvia, who runs the service, was friendly and extremely professional throughout the entire process. From the beginning, I was confident in Szilvia's ability to store my dress safely and to sell it quickly and she certainly didn't let me down! The dress was advertised beautifully on her website and sold within a month. Szilvia was then very quick to contact me and arrange payment. It can tug on your heart-strings a little to sell your wedding dress, even when you know it's the right thing to do and want an another bride to have the opportunity to enjoy it. Szilvia was really understanding and sensitive about this. On this basis, I think she'd be great at helping a future bride to choose the right dress for their special day. I will definitely be recommending the service to all of my friends. Thanks again Szilvia!! I recently used Dream Second Hand Wedding Dress Shop to sell my wedding dress and the service that Sylvia provided was excellent. From the beginning she was extremely friendly and always quick to respond to any inquiries I had. My wedding dress was sold much quicker than I had anticipated and for exactly the amount of money that I had originally hoped for. Once my dress was sold Sylvia was quick to contact me and arrange payment. I would thoroughly recommend her service to anyone looking for a wedding dress or with one to sell. I found Sylvia's business on the Internet and contacted her immediately. I wanted to sell my wedding dress, but I loved it so much that I spent a long time checking the best way to do it. She answered straight away to all my mails and doubts that I had. I felt very comfortable to choose her. She told me about the business and I had a chance to check the dresses she had - they were lovely! 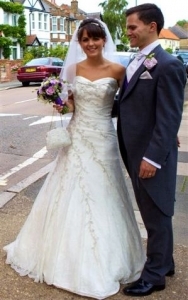 !- She was very kind and looked very professional, which made my husband and I very confident about leaving the dress with her. 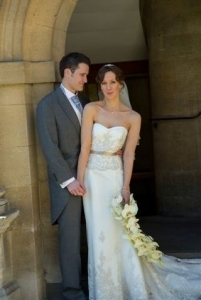 My beautiful wedding dress was sold very quickly and I'm happy another bride will enjoy it as much as I did. I really recommend Sylvia to anyone that is trying to sell or buy a wedding dress, she is very proactive, energetic and loves her business, which is exactly what you need when it comes to your big day. My husband and I loved her service and her quick answers. We wish her all the best in her business, she will do great for sure! Dream Second Hand Wedding Dress Shop is a home-run business set-up by a lovely lady called Sylvia. I was looking for a second-hand wedding dress and found her details on the internet. She had lots of lovely dresses, all in very good condition, some of which had never even been worn. 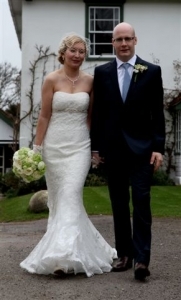 In the end, I found a Pronovias dress which had never been worn and paid £650 for it. Sylvia is very friendly and efficient - she went out of her way to be helpful, responding very quickly to calls and giving me as much time as I needed to try on dresses. I would wholeheartedly recommend checking Dream out if you are looking for a second-hand dress. Szilvia made the whole process of selling my wedding dress a lot easier – it took a great weight of my mind. 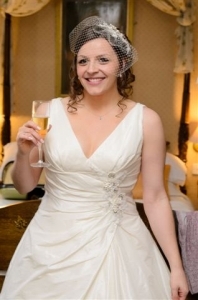 My wedding dress sold much more quickly than I expected and it was obvious that Szilvia took great personal care and interest in each of her dresses which made me confident that it would find a good home. Szilvia is a lovely person and I can’t recommend her highly enough! Thank you so much for helping me find my dream dress - It is stunning and I can't wait to wear it! It is obvious that wedding dresses are a passion for Szilvia, she is warm and friendly and was just as excited about my dress as I was! I would recommend anyone who is looking for their dream dress to go and look at the gorgeous dresses Szilvia has for sale... you won't be disappointed! Sylvia is amazing at what she does! She is so very friendly and so very helpful. She made me feel so special, like I was the only bride in the world shopping for a dress. She allowed me to take my time and even try the dress on twice! Her service is so personal, unlike when you go to a high street bridal store where you are just a number. I could not recommend her enough. She is amazing, and I wish her all the success with her business! Visiting Sylvia was mine and my mum first trip out looking for wedding dresses. I had a particular style of dress in my mind that I wanted and I ended up coming away with something completely different. And I could not be happier. Sylvia was so professional, friendly and made me feel like I was the only bride in the world. She has a wealth of knowledge and I really appreciated her honest opinion, as she knew what suited my shape and my skin tone. Sylvia has a wonderful range of beautiful dresses at very competitive prices and I would recommended any future bride to visit her. Having been to a few boutiques where the assistants, despite very clear specifications, were only interested in selling me the most expensive dress possible, I stumbled across dreamsecondhandweddingdress. I sent an email about a few dresses that I had seen and got a very prompt response; I found Sylvia to be highly professional, knowledgeable and incredibly helpful. I tried on the most beautiful dresses and Sylvia gave me an honest opinion about what suited my frame and colouring. I felt relaxed and able to discuss the different options of each dress. I found the most wonderful wedding dress, at a fantastic price, and I am so excited about wearing it! Sylvia obviously has a wealth of knowledge and a real passion for this business; this kind of quality service is so rare these days! I would absolutely, and already have, recommend her to my friends and anyone who would like a personal service when finding such an important item of clothing. My dress is beautiful and I am so grateful to Sylvia for helping me find it! I found my beautiful wedding dress through DreamSecondHandWeddingDress. It was easy to make an appointment as they are open late every day. Sylvia is very professional and helpful, she is passionate about her job and really cares about her customers. Spending time in her shop was fun (we chatted a lot), I got all the attention a bride needs – not like in some high street shops. Her one-to-one service makes you feel relaxed, there is absolutely no rush deciding (and you don`t feel you are being pushed to buy straight away either). Her dresses are in EXCELLENT condition and prices are affordable. I didn`t have to think twice when I purchased my designer dress and now I can`t wait to wear it! Thank You Sylvia x.
Dear Sylvia, After a very successful visit to your lovely shop I would like to say a very big thank you. The dress I bought is exactly what I had in my mind for my wedding. 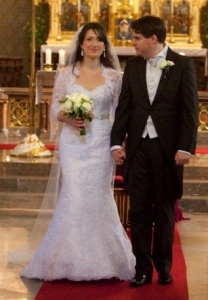 I had so many comments on my wedding day how lovely my dress was, everybody loved my dress. Thank you for all your help and support from choosing this outfit. Your wedding dresses are gorgeous with absolutely fantastic prices and you were so patient with me and so helpful (excellent customer service). I will recommend your salon to everybody interested in choosing the perfect outfit for wedding. I loved the dress and the day was wonderful! 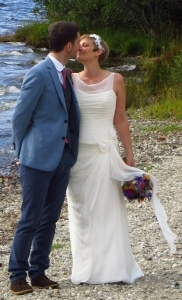 Sylvia is amazing, I found my dress on her website but only to find it had sold not long before I asked about it. She went out of her way and found me another one which was even better and fits like a glove. I felt AMAZING in it and couldn't felt like that with out the dress. Thank you for all your help Sylvia you were so kind and helpful and what a bargain my dress was. Sylvia was a massive help in helping me find my ideal dress. On my first visit I didn't find exactly what I wanted but she soon contacted me after and had the actual dress I was looking for, it fitted sooo well and only needed minor alterations. She really is enthusiastic and caring about each brides wedding and genuinely wants your day to be a success! We had an amazing day! The dress felt wonderful on and I couldn't have been happier with my choice! Thanks once again for everything you helped with! Sylvia was very professional, we were able to organize to see her at short notice. We’d picked out some dresses from the website which were all ready to go, and she had lots of beautiful other dresses to suggest and to try on. The first one she suggested was the dream dress I ended buying so you can see she has a great eye. You can tell she really loves wedding, as we had a lovely time chatting, and you really feel she loves what she does. Highly recommended! I am so happy I found Sylvia as she was so wonderful in helping me to find my dream dress. She had a huge range of dresses for me to try, and was really helpful and patient. I felt amazing in the dress all day long and was so sad to have to take it off at the end of the day. No one would ever have guessed it was second hand, and I’m so happy that I was able to wear a stunning designer dress, even if it was just for a day! I’m so glad I came to Sylvia instead of paying over the odds in a bridal shop, so I’ll be sure to recommend you to anyone I know who is getting married. After searching the internet for months on end trying to find my dream dress and visiting countless bridal boutiques without any joy, I am so glad I came across Sylvia's site. She was so easy to communticate with over emails and I felt so comfortable with her when I went to try on the dress- she even showed me a passion we both have in common- her shoe collection! The moment I put the dress on I knew it was the one and I am so pleased I found her website and met Sylvia. I felt beautiful on my wedding day and received so many positive comments about my dress. Over a month later and the dress is still hanging up in my spare bedroom- its too beautiful to pack away! I know I made the right decision to buy from Sylvia and I would recommend her to any bride who is looking for their dream dress without the designer price tag as my dress cost 60% less than on the designers website! Thank you so much Syvlia. You helped me feel like a princess on my special day. 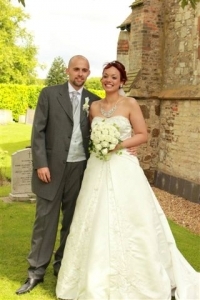 Excellent seller of second hand and sample authentic designer wedding dresses. Great selection of dresses in a range of sizes, all in great condition. Very affordable in comparison to all the bridal boutiques. This unexpected find meant I really did get my dream dress without spending a small fortune. I came across what I thought was THE dress at a local designer boutique store but just could not justify the cost for a dress for just one day. I tried in vain to find the dress elsewhere without success and ended up going back to the boutique store only to find the dress had been sold and would not be re-stocked. I thought that I would have to choose another dress and started looking for sample dresses on the advice of a friend although I could never find a sample dress in white; the colour which best suited my skin tone. It was only by chance, when I thought all hope was gone, that I came across Szilvia's wedding dress website in a random google search. It was almost too good to be true; my dress in the same size I had tried in the local shop, and in white! In a mad panic I contacted Silvia by email and she confirmed the dress was still available and that it was a sample dress, she it had a few loose beads but she would attend to those if I wanted to come and truy the dress on in her store. I asked Szilvia if she would send me the dress but she was worried about doing that without me seeing the dress first. I trusted Szilvia when she said the dress was in very good condition and she shipped the dress to me. It arrived and it was perfect - it was like new, there were no loose beads, it was very clean, well packaged and with super fast delivery. I couldn't have been more pleased; I had managed to obtain my dress from Szilvia with minimum hassle and less than a third of the price quoted in the local boutique store. I can't thank Szilvia enough for such an easy transaction and for stocking the dress! I sold my dress through Sylvia, and what a great decision! Sylvia was friendly, enthusiastic and professional, she gave great advice on pricing expectations and was clear on what I should expect about how long it would take. She obviously did a great job, the dress was sold in less than 2 weeks!! I think this is down to her enthusiasm and passion for the job! Her opening hours are fantastic, she understands that brides have jobs so to be able to try the dresses on has long opening hours during the week and weekends. I can't recommend her enough. Thanks Sylvia. I wasn't expecting to buy my wedding dress when I visited Sylvia, I was merely going to get ideas and inspiration. But Sylvia had a beautiful range of wedding dresses at exceptionally reasonable prices. The bridal shops I had previously visited were way over my budget and made for 6ft models. Sylvia's selection, even if they were worn once before, you would never know as they were pristine. Sylvia's approach was extremely professional, very friendly and hospitable. I felt at ease and I would highly recommend Sylvia's business for finding your perfect wedding dress. Sylvia's was the first place I looked for a dress - and I bought the second dress I tried on! I knew I didn't want to spend a ridiculous amount of money on something I would wear only once, but I also knew I wanted the wedding dress I'd always dreamed of. A friend suggested I look into second hand dresses. Sylvia's was the only site I could find where you could actually go and try on dresses in a boutique like atmosphere. Sylvia was so warm and welcoming to my 2 friends and I. Her dresses are beautiful and in perfect condition. No one would be able to tell they have been worn or used as a sample. I can't believe my luck that I found the perfect man, the perfect dress, AND saved GBP 1k! I definitely recommend Dream Second Hand Wedding Dresses. I would highly recommend Dream Second Hand Wedding Dress. I tried to sell my dress on a few different websites before hand having no luck. Then I came across Sylvia's company and what a fantastic idea! She is so friendly and within around 1.5 months my dress had sold for the price I wanted. After sending her my bank details the money was transferred within minutes. I would recommend her service to anyone, whether you are selling or buying. You can tell Sylvia loves her job which makes her place a wonderful environment to be in. Sylvia at Dreams has sold a wedding dress for me and I thoroughly recommend her and her shop. It has been a hassle free process, she was realistic with the guide price and she has sold it very quickly. I considered putting the dress online but decided against this as I know I wouldn't buy such an item online so Dreams has worked perfectly for us. Thank you Sylvia! Lots of choice of dresses, and friendly service. Szilvia gave me wonderful advice chosing my dress and a great price. I couldn't have been happier with my choice! She was also able to reccomend a great seamstress to help with any needed adjustments. I would definately reccomend her! 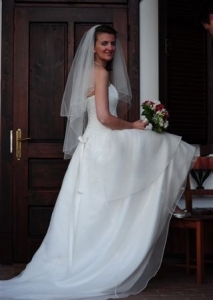 My husband and I decided to go travelling after we got married, so I decided to sell my wedding dress. I first tried the Internet, but that did not work. Then I found Sylvia. It was such a pleasure to work with her. She is friendly, professional and sold my dress in a matter of months and the money was deposited into my account quickly. I would definitely recommend her! Visited Sylvia back in Feb/March time, my first wedding dress shop, i knew from the moment i got there that i was purchasing my dress that day from Sylvia as i knew i was in the right and best place and i did, second dress on and i fell in love with it, it was mine and i wasn't leaving until i had put my money down. Sylvia is a highly dedicated, professional and delightful lady with a great business, beautiful high quality dresses with an immaculate studio above her own home. A very kind, friendly, bubbly lady! Would 1000% recommend! Thank you Sylvia! Thank you so much for selling my dress...and so quickly! A very efficient, professional and friendly service, I will certainly be recommending you to friends.